This piece also at USNI News. The Defense Advanced Research Projects Agency (DARPA) has constructed a neuromorphic device—the functioning structure of a mammalian brain—out of artificial materials. DARPA’s project, SyNAPSE (Systems of Neuromorphic Adaptive Plastic Scalable Electronics) signals a new level for biomimicry in engineering. The project team included IBM, HRL, and their subcontracted universities. Biomimicry is not new. The most recent example is the undulating “robojelly” developed by the Universirty of Texas at Dallas and Virginia Tech. This new drone swims through the sea like a jellyfish, collecting energy from the oxygen in the water, as does any breathing organism. There is also the graceful Pesto SmartBird, an aerial drone that mimics the shape and physical flight of birds. A knockoff was found crashed in Pakistan. If not the shape, at least the actions are often mimicked, as shown by UPenn’s quadrotors being programmed to use crane claws like predatory birds rather than construction cranes. However, these examples of biomimicry only cover the external actions of an animal. SyNAPSE goes deeper, building a synthetic version of the mind that develops these actions. In the quest for autonomous machines, the suggestions have been either-or: machines programmed to be like brains or the integration of biological processors to provide that processing flexibility. DARPA has found the “middle path” in constructing a series of synthetic synapses out of nano-scale wire. This takes the physical form of those biological processors and constructs them from the base material of conventional computers. According to James Gimzewski at UCLA, the device manages information through a method of self-organization, a key trait of autonomous action and learning, “Rather than move information from memory to processor, like conventional computers, this device processes information in a totally new way.” Moving past the surface mimicking of physical shape and function, SyNAPSE will mimic living organisms’ basic way of processing information. However, as the possibility for real autonomy approaches, the legal challenge becomes more urgent. An article in Defense News summarizes the catalogue of problems quite well, from accidental breaches of airspace/territorial waters, to breaches in navigational rules, to accidental deaths all caused by machines not having a direct operator to hold responsible. However, as the director of naval intelligence Vice Admiral Kendall Card noted, “Unmanned systems are not a luxury; they are absolutely imperative to the future of our Navy.” Like the CIA’s armed predator program, someone will eventually open Pandora’s box and take responsibility for their new machines to gain the operational edge. DARPA’s SyNAPSE project is that next step toward an autonomous reality. 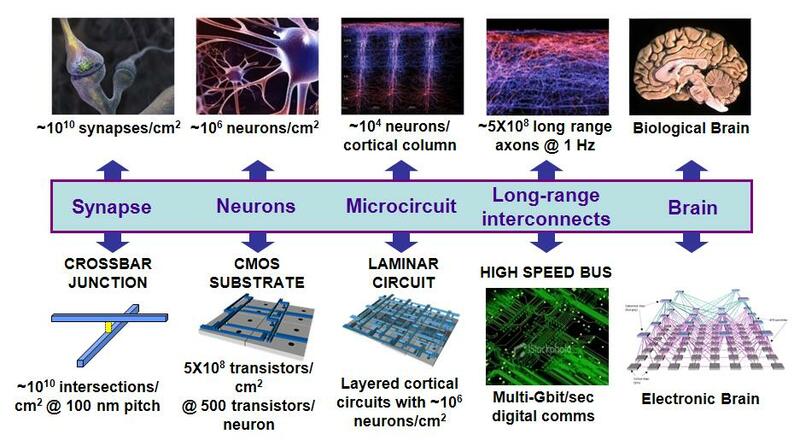 A DARPA scale of the make-up of a neuromorphic circuit and their biological equivalents. As the tide of automated warfare rises, optimists are already attempting to ride the wave. I do so in Proceedings, suggesting possible paths of development for autonomous platforms, and at the Disruptive Thinkers blog Ben Kohlman and I imagine future scenarios in which automated platforms might be used. Admittedly, we often ignore the many ways our concepts can wipe out: particularly signals hijacking and spoofing of navigational systems. As illustrated by eavesdropping on Predator communications and the recent forced crash of a drone in Texas, determined enemies can steal information or cause mayhem if they break the code on combat robot (ComBot) operations. Ideas for securing these advanced automated armadas can be found in some of the oldest methods in the book. In 2002, LtGen Paul Van Riper became famous for sinking the American fleet in a day during the Millennium Challenge exercise; he did so by veiling his intentions in a variety of wireless communications. We assume wireless to mean the transfer of data through the air via radio signals, but lights, hand signals, motorcycle couriers, and the like are all equally wireless. These paleo-wireless technologies are just what ComBots need for signal security. ComBot vulnerabilities to wireless hacks are of particular concern for planners. Data connections to operators or potential connections between ComBots serve as a way for enemies to detect, destroy, or even hijack our assets. While autonomy is the first step in solving the vulnerability of operator connections, ComBots in the future will work as communicating teams. Fewer opportunities will be provided for subversion by cutting the long link back to the operator while maintaining the versatility of a small internally-communicating team. However, data communication between ComBots would still be vulnerable. Therefore, ComBots must learn from LtGen Van Riper and move to the wireless communications of the past. Just as ships at sea communicate by flags and lights when running silent or soldiers might whisper or motion to one another before breaching a doorway, ComBots can communicate via light, movement, or sound. Unlike a tired Junior Officer of the Deck with a NATO code-book propped open, computers can almost instantly process simple data. If given the capability, a series of blinking lights, sounds, or even informative light data-transmissions could allow ComBots of the future to coordinate their actions in the battlefield without significantly revealing their position. ComBots would be able to detect and recognize the originator of signals, duly ignoring signals not coming from the ComBot group. With the speed and variation of their communications, compressed as allowed by their processing power, ComBots can move through the streets and skies with little more disruption than a cricket, lightening bug, or light breeze. High- and low-pitch sounds and infrared light would allow for communications undetectable to the average soldier. LtGen Van Riper melded a deadly combo of new weaponry with old communications to build a force capable of, with the greatest surprise, wiping out a force armed with the greatest technology in every category. Utility, not technology, is what gives us the edge in the battlefield. Sometimes it is a combination of the old and new that allows for the potency. Perhaps, one day, ComBots will be set loose into the battlefield where they will operate more as a pack driven by sight and sound than a military formation managed over a data link. GPS: How About a Map? The Texas incident has broken open the doors on a previously low-key vulnerability for ComBot systems, navigation. While speculation is rife as to how the CIA lost a drone in Iran, it is quite clear that the researchers in Texas were able to spoof a ComBot into destroying itself. Spoofing of externally-based navigational systems is a potential way to turn aerial ComBots in particular into weapons against us. It is often forgotten that systems that are “autonomous” still rely on outside guidance references that can be manipulated. While civilian GPS is less secure than military-grade GPS, the potential for GPS spoofing to lay-low a combat force is a chilling one. However, the solution can be found by augmenting legacy techniques with modern processing. Terrain Contour Matching (TERCOM) and Digital Scene Mapping Correlation (DSMAC) are non-GPS methods of navigation that specifically use internal recognition of local terrain and urban landmarks to maneuver Tomahawk missiles. This is another way of, “looking around and reading a map.” Processing power advances since the system was first introduced during the Cold War mean greater amounts of recognition data can be processed in shorter amounts of time by smaller platforms. ComBots deployed to specific areas can upload local data to allow localization based on terrain from high altitude or Google-maps-style scene matching from rooftops or even street-by-street. With adaptive software, ComBots could even “guess” their location if the battlefield changes due to combat destruction, noting changes in their environment as damage is done. While GPS can be spoofed, unless the enemy has been watching too much Blazing Saddles, DSMAC and TERCOM will be nigh impregnable navigational systems. This defense for ComBot operations can also act as a navigational redoubt for a fighting force. The downing of GPS satellites or the spoofing of signals effects everyone using electronic navigation systems. Aerial ComBots outfitted with TERCOM and DSMAC could act as a secondary GPS system in an area with a GPS outage. If signals are jammed or satellites taken out, warfighters or other navigationally lesser-developed ComBots could triangulate their positions based on the system of ComBots with locations determined by TERCOM and DSMAC. By adding these recognition systems to autonomous drones, commanders will defend ComBots from hijackers and combatants from the choking fog of war. The key to the safe and effective use of ComBots is to avoid the extremes of optimists and luddites. Optimists will look far into the realm of capability before necessarily researching vulnerabilities, abandoning the old for every shiny new development. Luddites will make certification and security processes long and complicated, cowering from the strange light new technology brings; ComBots would run on Windows 95 and take 30 minutes to log on to themselves. It is best to advance fearlessly, but take our hard-learned lessons with us. Non-digital communications, aka speech and signals, and localized navigational systems, aka carrying maps, offer ComBot developers a shield against interlocutors. Our new dogs will be best defended by some of the oldest tricks. This article appeared in its original form at Small Wars Journal.